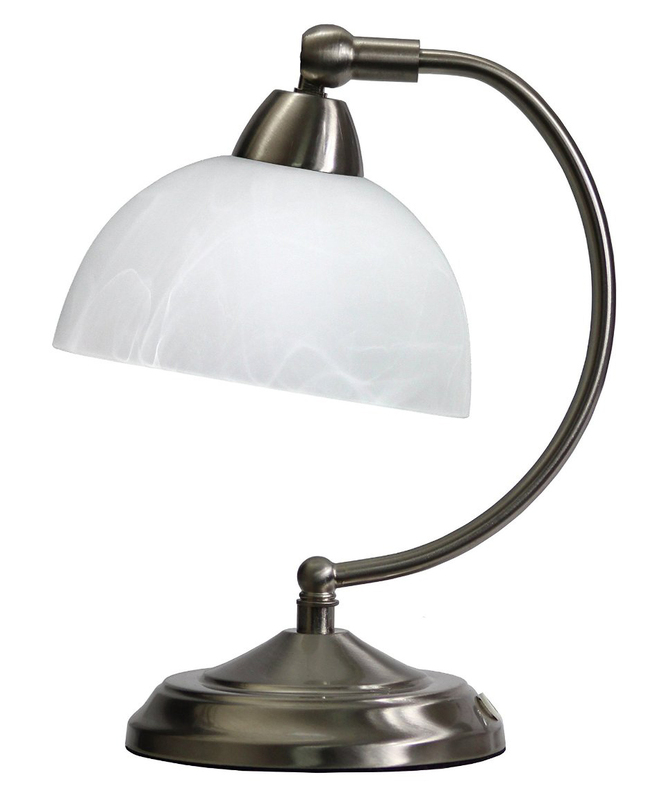 Make a fashionable statement with this 1-light desk lamp from the Aurora Lighting Collection. It will impart a splendid style to your space with its contemporary frame and delightful black finish. 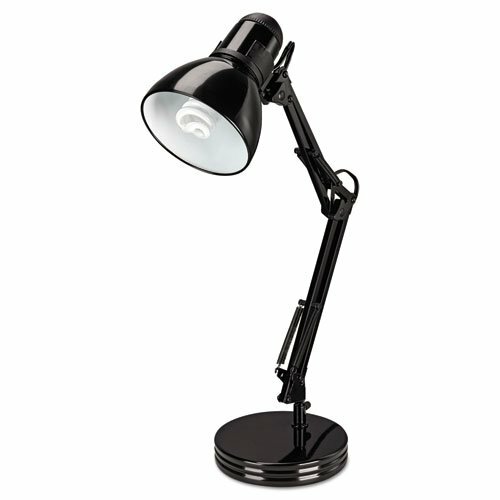 A perfect match with most interior styles, this desk lamp brings a unique look to any bedroom and a comfortable atmosphere with its LED shine. Functional and stylish, the 1-light desk lamp from the Working / Task Lamps Collection is an excellent choice to illuminate your home's interior. Built with a modern design and decorated with a fashionable black metal shade, it easily coordinates with most any home office décor and adds its own artistic charm. 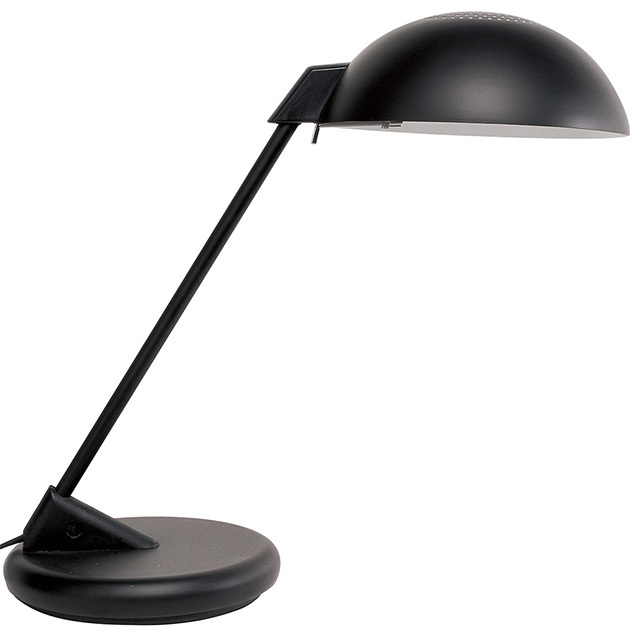 Combined with a striking black finish and warm incandescent glow, this desk lamp is a perfect fit for any home. 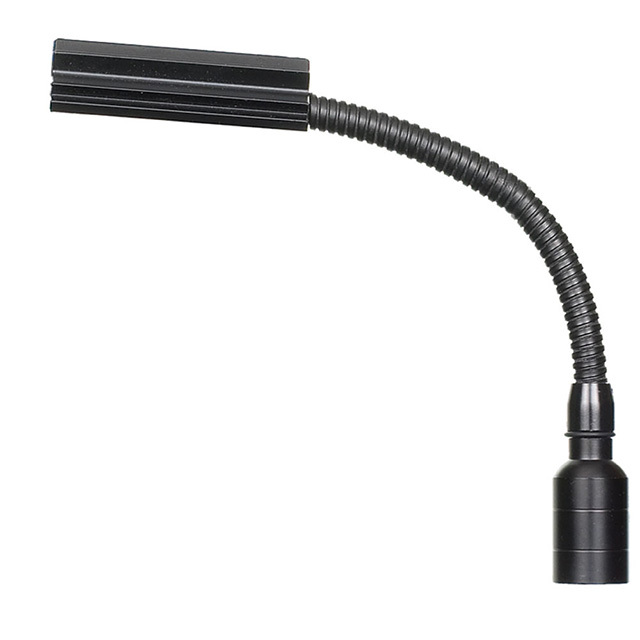 Our line of Working Lamps offers a sleek design and supreme functionality you'll appreciate. The range of options includes clamp-on and professional quality models in adjustable designs. Spring balanced arms ensure reliable service. Lighting is important in your home office and even occasional work spaces. Whatever your work functions, our Lamps will help you get the job done efficiently and in style. 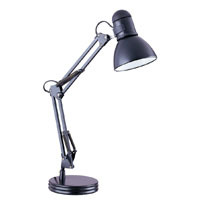 Offering plenty of versatility and character, the 1-light desk lamp from the Magnifier Lamp Collection coordinates wonderfully with a variety of interior décor and provides bright and full illumination with its brilliant black metal shade. 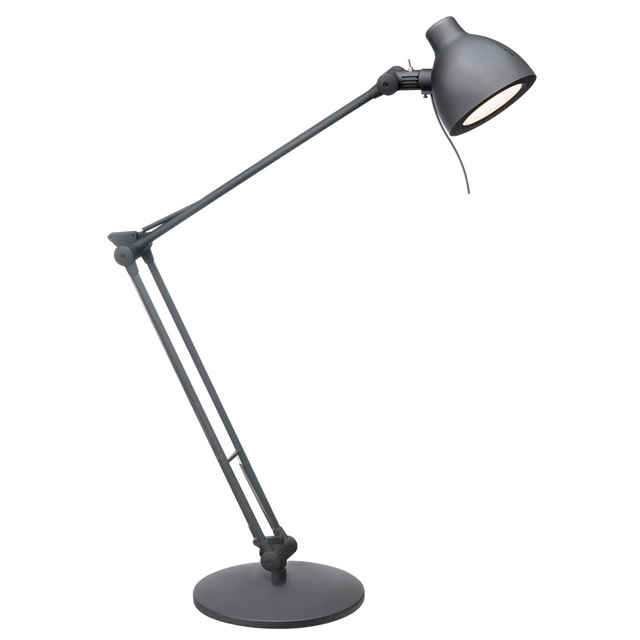 Featuring modern elements and a sophisticated black finish, this desk lamp is an ideal solution for your lightning needs. If your needs require magnification, our Magnifier Lamp gives you high end functionality while still paying attention to style cues. 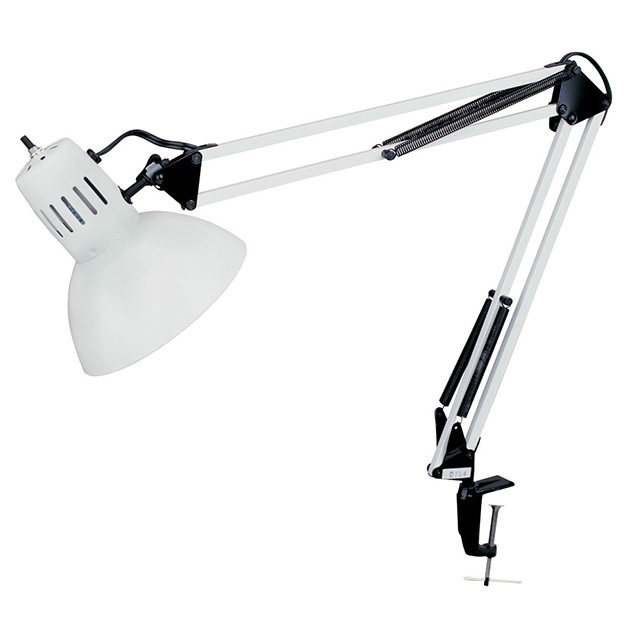 The fluorescent Magnifier Lamp features a gloss white or almond finish and 3D lens option, with additional options for wall mounting or clamp-on bracketing, including heavy duty industrial accessories and various magnification levels. Form and function come together seamlessly in our Magnifier Lamp. Designed with a modern flair, the 1-light desk lamp from the Magnifier Lamp Collection features a stunning fusion of a rich white finish with an elegant white metal shade. A marvelous fluorescent hue further elevates this combination, making the desk lamp a perfect fit for any home office and a great addition to your home's interior. Providing an abundance of inviting color, the 1-light desk lamp from the fribourg Collection is a beautifully crafted fixture that shines brightly in any modern lighting scheme. With a stylish black/silver finish and black metal shade, the desk lamp features rich hues that will impress guests and certainly provide lasting enjoyment. 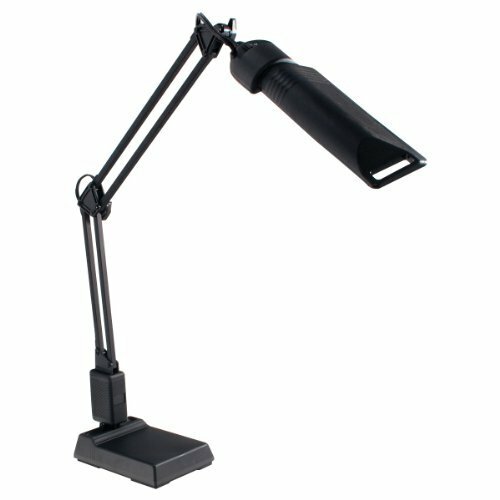 Multi-functional task lamp with attachable base for desktop use or an attachable clamp to attach to surfaces up to 2 1/4" thick. Swing arm with two pivot-points to adjust the direction of the light. The lamp head rotates to allow the user to direct the light. Includes 13W compact fluorescent energy-efficient bulb. Matte black finish; rock on/off switch. Some assembly required. 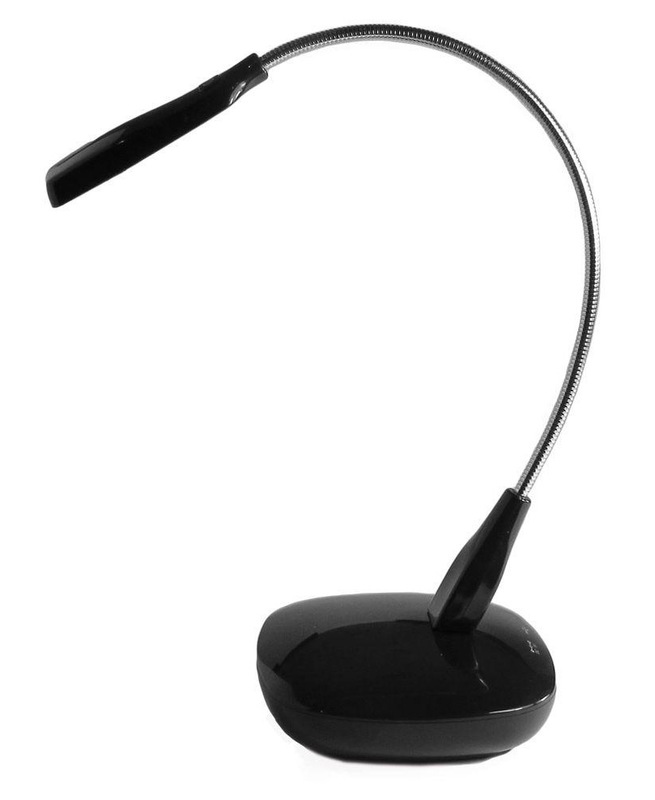 Base Color: Matte Black; Plug Type: 2 Prong; Height: 30"; Width: 5". Contemporary lamp uses energy-saving LED light. 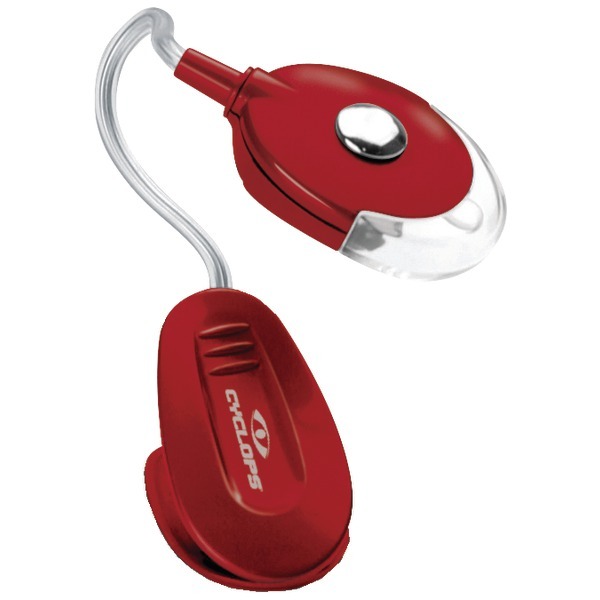 Adjustable head and arm lets you direct light onto the task at hand. Base Color: Silver; Plug Type: 2 Prong; Height: 17 3/4"; Width: 3 1/4". Designed with a cohesive black finish and black metal shade, this 1-light desk lamp is a great addition to any interior setting and will light up your home with glowing warmth. Built with a modern design and quality materials, it will be easy to install and simple to match with most interior furnishings and architectural styles. Adorned with a stunning black metal shade, this 1-light desk lamp brings a rich, contemporary elegance to any bedroom and adds a sophisticated touch to most any interior style. Pairing the eloquent styling of the Aurora Lighting Collection with a black finish, this LED desk lamp is certainly a must have. 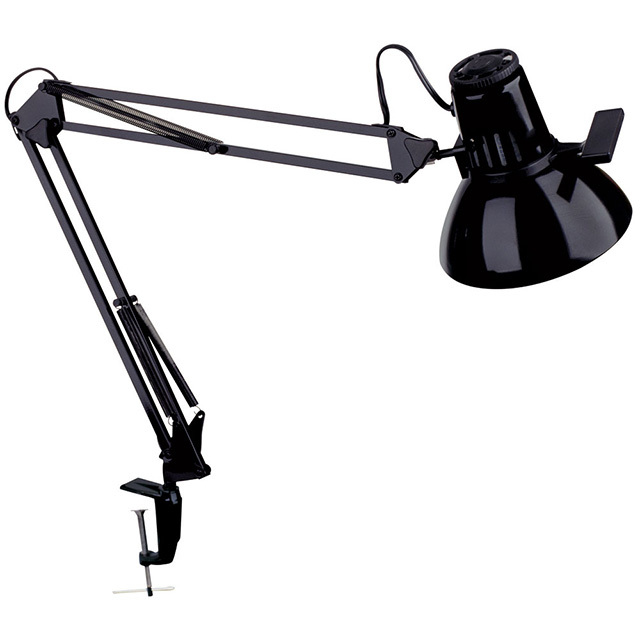 Flexible, gooseneck arm to position light where you need it. Heavy weighted metal base. Easy-dial on/off switch. Metal construction. Black. 2-Prong plug. Includes 13W compact, fluorescent bulb. Some assembly required. Base Color: Black; Plug Type: 2 Prong; Height: 16 1/2"; Width: 5 1/2". The workhorse lamp for any office, studio, or home. Two-point adjustable arm for maximum reach when you need it and out-of-the-way when you don't. Adjustable shade rotation to focus light where needed. Includes tension knobs to lock arm and shade in working position. 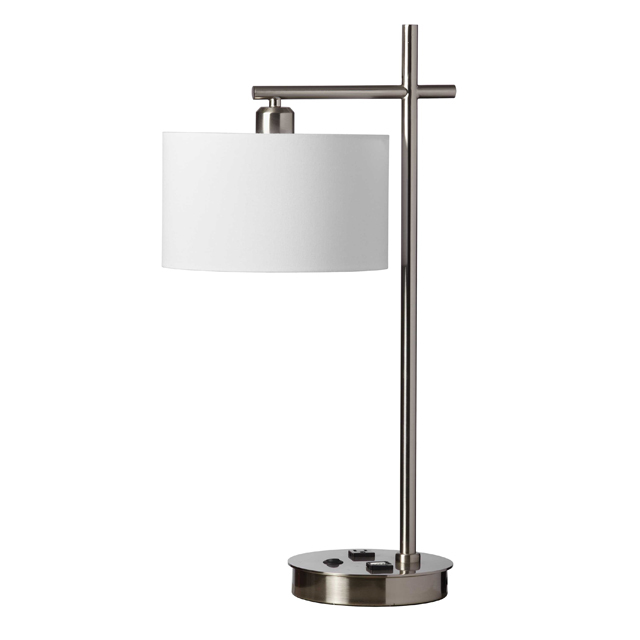 Tower style weighted base includes locking pin to prevent lamp from lifting during use. Metal base, arms and shade for maximum durability. 13W CFL bulb is included. Rotary on/off switch conveniently located on shade. Base Color: Black; Plug Type: 2 Prong; Height: 22"; Width: 6 3/4". 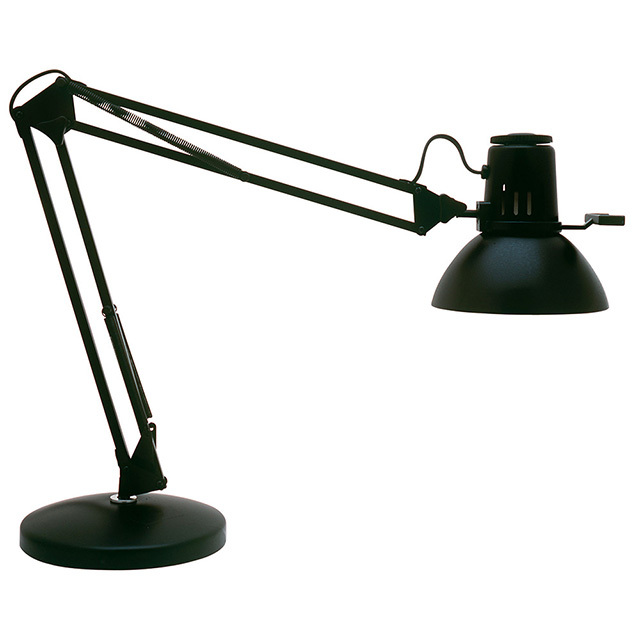 A classic take on the professional architect's lamp for wide light dispersal. Two-point adjustable arm for maximum reach when you need it and out-of-the-way when you don't. 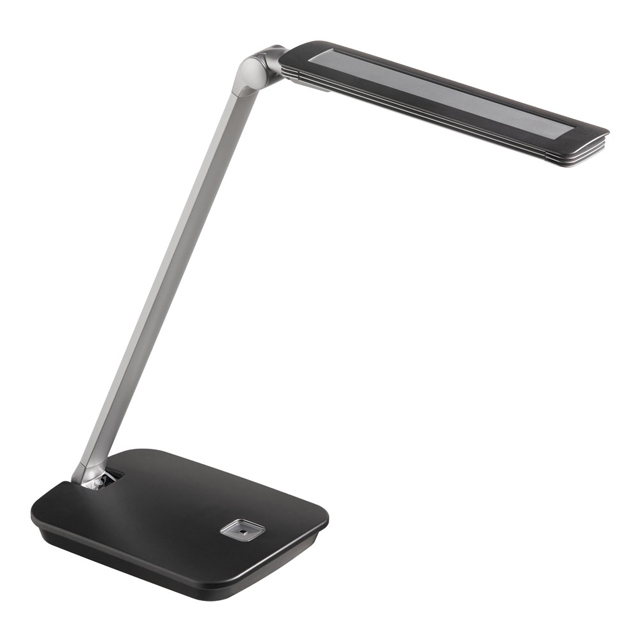 Lamp rotates 360� in clamp for maximum flexibility at work station. Adjustable shade rotation to focus light where needed. Includes tension knobs to lock arm and shade in working position. Non-skid mounting clamp attaches securely to surface. Protective felt on clamp protects surface from marks and scratches. Metal arms and shade for durability. 13W CFL bulb is included. On/off switch conveniently located on shade. Base Color: Black; Plug Type: 2 Prong; Height: 28"; Width: 6 3/4". 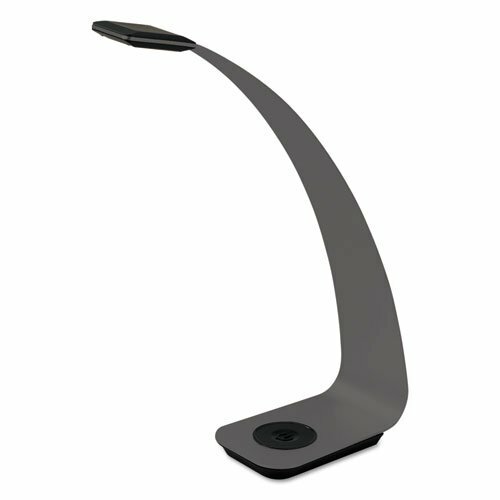 Sleek profile that will take up minimal real estate on your desk..Allows flexibility. You can easily adjust the angle of light.Black Finish.Metal Shade.Rotary Lampholder On/Off Switch.Uses a 60 Watt Type A19 Bulb (regular sized bulb socket) (not included).26" Adjustable Height. 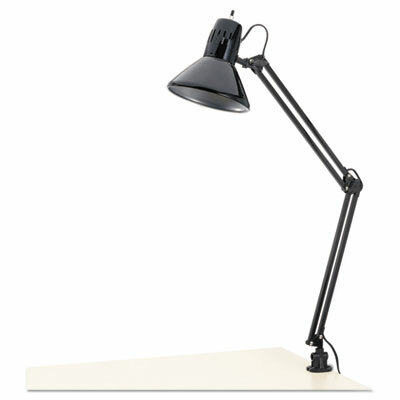 Make a fashionable statement with this 1-light desk lamp from the Working / Task Lamps Collection. It will impart a splendid style to your space with its modern frame, opulent black metal shade, and delightful black finish. A perfect match with most interior styles, this desk lamp brings a unique look to any home office and a comfortable atmosphere with its incandescent shine. Adorned with a stunning white metal shade, this 1-light desk lamp brings a rich, modern elegance to any home office and adds a sophisticated touch to most any interior style. Pairing the eloquent styling of the Working / Task Lamps Collection with a white finish, this incandescent desk lamp is certainly a must have. Attractive contemporary one-piece curve design makes a statement on your desk. "Smart" touch switch has three-level dimming and auto shut-off functionality. All aluminum construction with a graphite gray finish. 3 watt surface-mount LEDs have an average rated life of 20,000 hours. Great for use in a small space. Base Color: Graphite Gray; Plug Type: 2 Prong; Height: 11 1/2"; Width: 3". Providing an abundance of inviting color, the 1-light desk lamp from the fribourg Collection is a beautifully crafted fixture that shines brightly in any modern lighting scheme. 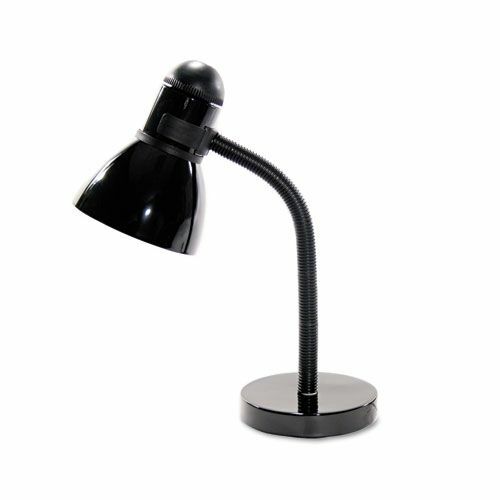 With a stylish matte black finish and matte black metal shade, the desk lamp features rich hues that will impress guests and certainly provide lasting enjoyment. Adorned with a stunning matte black with silver accents, this 1-light desk lamp brings a rich, contemporary elegance to any bedroom and adds a sophisticated touch to most any interior style. Pairing the eloquent styling of the Aurora Lighting Collection with a black finish, this LED desk lamp is certainly a must have. 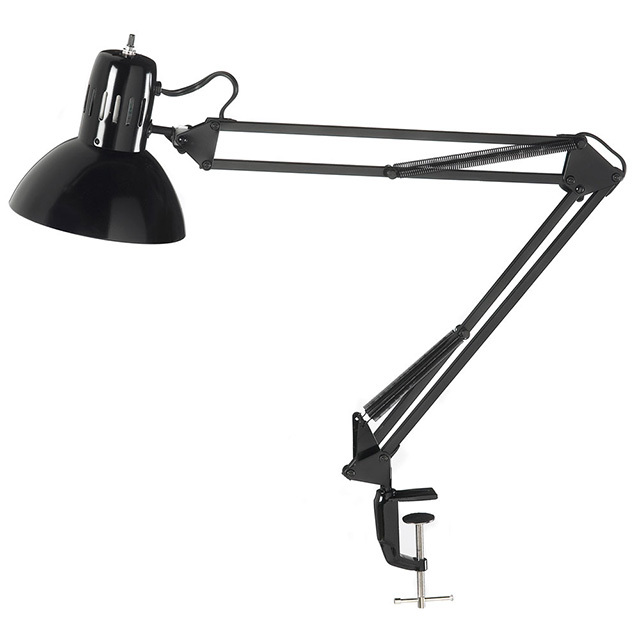 From the Working / Task Lamps Collection, this 1-light desk lamp possesses a decorative black finish with a matching shade in exquisite black metal. With a modern style and posh finish, this incandescent desk lamp couples beautifully with any home office and will perfectly highlight your interior décor. 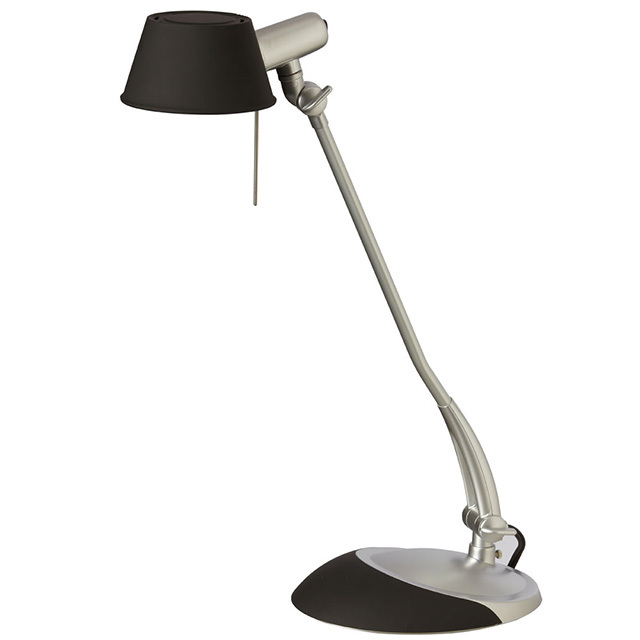 This modern mini banker's lamp features a curved arm and touch control dimmer base with an exquisite finish. The marble glass shade finishes the look. A charming, inexpensive, and practical desk lamp to meet your fashion lighting needs. Perfect lamp to complement your office decor. Dimensions: L: 6.20" x W: 8" x H:11"